Nazli Nahidi, Mural Routes Program Assistant, interviewed artist Dom Laporte in February, 2019. 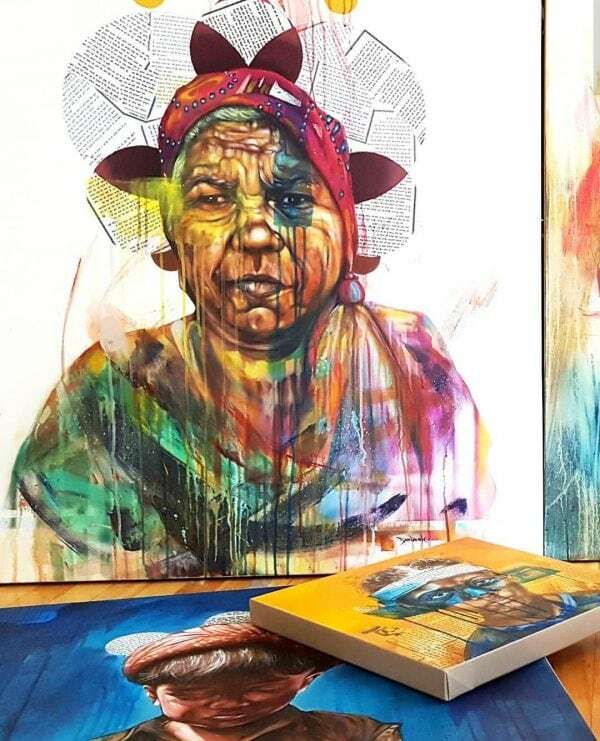 Dom Laporte is an Ottawa-based artist whose work explores the limits of portraiture through a combination of traditional painting and mixed-media methods. Laporte believes that portraiture has a unique ability to transcend the artist’s individual voice—whether he’s painting a respected personality in the local hip hop community or someone he met while travelling in India, a single face can evoke a wide range of themes, emotions, and cultural backgrounds. In this way, his work is a celebration and an embodiment of the diverse identities and life experiences that he encounters. Laporte’s work has always been inspired by his direct surroundings—mural painting pushes this practice further by encouraging experimentation with new style combinations that best reflect the built environments and dynamic communities of each mural’s distinct location. Your previous series ‘Part & Parcel’ seemed to use portraits as a medium to experiment with concepts and issues of representation. What motivates you to depict a certain person? In recent years the motivation to paint a specific person comes from those I meet while travelling. My current body of work is focused on portraits from photos taken while in India in 2017. Usually its a combination of a striking expression or natural look and the clothing they have on, what they’re holding or doing in that moment. Its really a gut feeling sort of thing. I know immediately if it will make a good painting or not. And how do your mediums come into play? Depending on if I’m painting on canvas or a large scale mural I will use certain mediums. Acrylic is almost always being used based on its versatility for small and large scale work, but mainly used when painting portraits. Spray Paint for large scale work and details on smaller work. I’ve always considered myself a mixed media artist and not just a painter, often using paper and collage materials sourced from my travels in France, India and Japan. Painting by Dom Laporte: part of his solo exhibition at the Ottawa Art Gallery / Annexe Gallery in April of 2019. You studied illustration in school and you also create work on canvas. When and why did you decide to begin creating murals? I studied Illustration as a way to make a living with my art in a practical way initially but found murals were far more lucrative and fun. I came from a graffiti background like a lot of mural artists and I’ve grown to understand the power of public art. I still do illustration work of course. Do you have a favourite mural of yours? 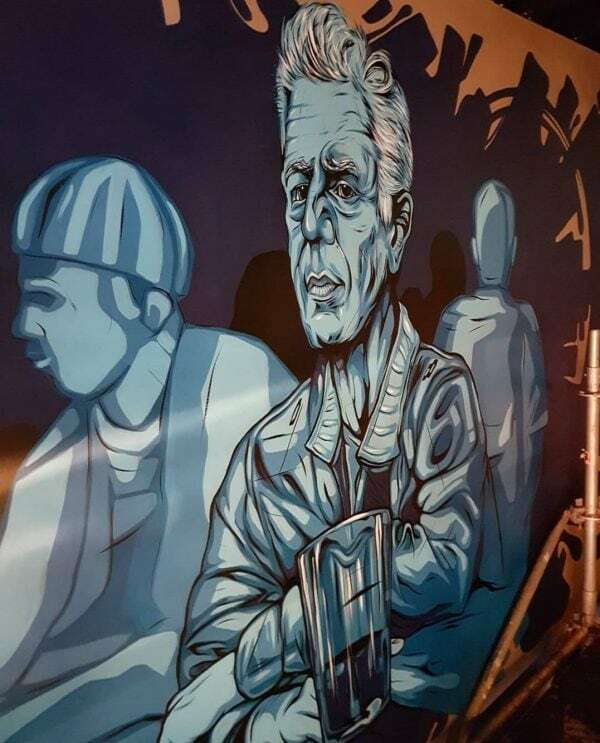 My favourite mural I’ve done solo is my most recent in a brewery in Ottawa called Flora Hall where I painted a tribute of Anthony Bourdain. My favourite collaborative mural is a wall I did with my brother for GlowFair Festival last year on Bank St (see my site for images of that). 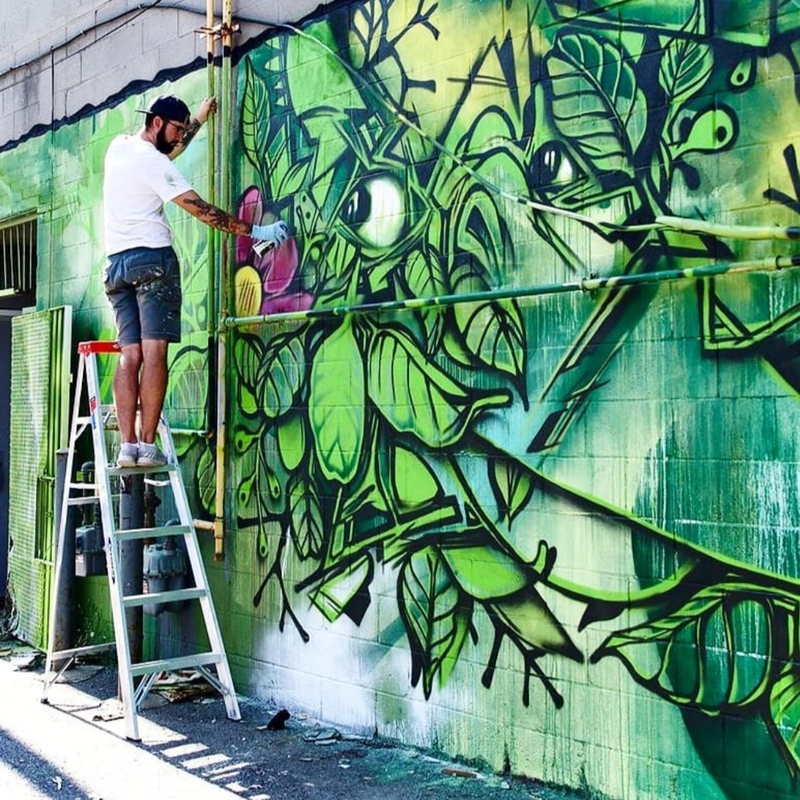 Can you tell us about a recent mural project you’ve completed or are working on? Most recent project as mentioned was for Flora Hall Brewery, completed a week ago. I made a contact through a local gallery and was informed that this brewery was looking for a mural artist and after an initial meeting was set up and quote was agreed upon I began initial sketches. Mural work is my passion and livelihood as an artist, I couldn’t work full time as an artist if it weren’t for murals. I’ve always worked on large canvases so murals have been a natural progression for me in my practice. Detail: Interior mural at Flora Hall Brewing, 37 Flora St., Ottawa. A tribute for Anthony Bourdain. There are too many to name honestly but off the top of my head: Caravaggio, Tim Okamura, Andrew Salgado, Kofie, Fintan Mcgee, Aryz, Juan Carlos Noria, Tim Desclouds, my brother Phil and of course the original inspiration and artist in the family, Mom. I see that you have an upcoming solo exhibition at the Ottawa Art Gallery / Annexe Gallery in April of 2019. Can you tell us more about how this came about and the work that you’ll be showing? I was offered a solo exhibition at the Ottawa Art Gallery/Annexe Gallery in November of 2017 after getting one painting from a new series accepted on consignment to the new commercial gallery. After that I told the curator that I would continue to send her updates on the series as I finish the paintings so after sending 5 or 6 more paintings she made the offer for exhibition. I suppose being persistent and productive pays off! The body of work I will be showing is based off my travels in India will be made up of large scale portrait work and some select sculpture as well. The show is entitled ‘Pranayam’ and opens on April 10th 2019. Do you ever hit artist blocks in your practice? If so, how do you overcome these hurdles? I can’t define artists block but I know the difference between being in the zone and being productive and not..I usually just don’t force it and step away. Go into the sketchbook more, draw from life, get some exercise, or cook. Take the pressures of the creative threshold off for a little while. 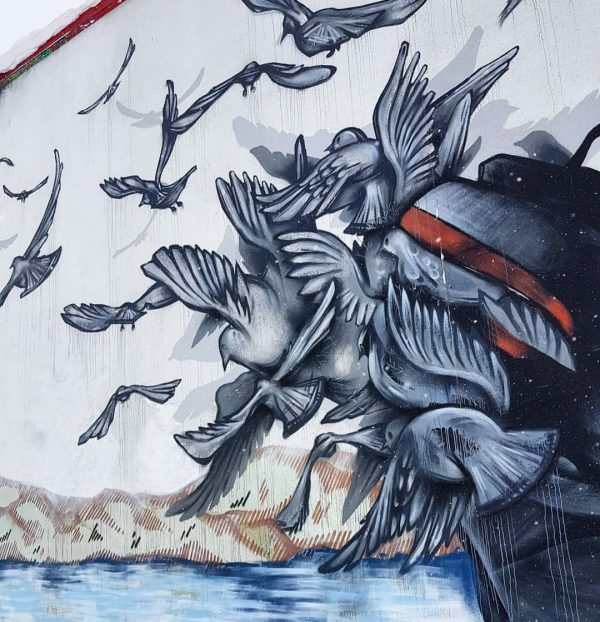 For mural artists most often the winter can be difficult since you can’t paint outside. What’s your process in the winter months? And how do you maintain contact with the mural community at this time? Winter months are always difficult for those of us that do this full time. Usually I can secure 2 indoor mural commissions for the winter. Either way I’m constantly searching and applying for grants, calls for mural artists for the spring/summer, search out opportunities and set up my own meetings. When the work isn’t flowing in you have to be proactive. Never underestimate the value of reaching out to other artists at these times and discuss / make a game plan. In Ottawa the mural community is really small so we talk often and collaborate to lessen the weight of competition when the pickings are slim. How did you hear about becoming a Mural Routes member? I heard about Mural Routes when I was competing in the National Art Battle finals in 2017 in Toronto. My friend Kalkidan Assefa is also a MR member and he introduced me to the founder that night. I signed up a month or so later. How has it been helpful so far? I’ve yet to receive any mural work directly from Mural Routes but the emails reminding me of local and regional mural calls have been very helpful and still are now. How can we support you in the future? This interview will help me get my name out there in the Mural Routes community so I thank you for wanting to hear more about my work! Detail from: Staples Dom’s largest mural painted to date on the side of Staples in Center town, Ottawa. 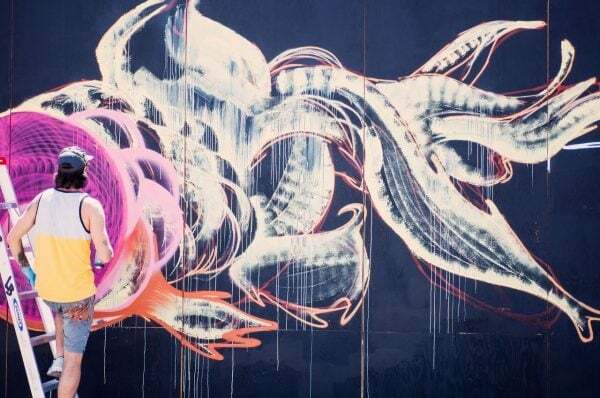 30 x 100’ – Collaborative wall with Ottawa mural artist Dan Metcalfe.